PPBM chairman Dr Mahathir Mohamad says Malays must come to terms with the fact that they have faults and flaws. PUTRAJAYA: Prime Minister Dr Mahathir Mohamad has once again criticised the Malays, accusing them of being lazy and taking the easy way out. Speaking to PPBM Youth delegates today, Mahathir, who is also party chairman, said this was the reality being faced by the community now in many fields, but especially when it came to the economy. “Why? Why are others successful and we are not? Yes, we can blame others for stopping us and cheating us, but others will not correct themselves for us to succeed. Only we can help ourselves to succeed. “And for that to happen, we need to know our faults and our flaws. We have many faults,” he said in an impromptu address to PPBM Youth delegates at their annual general meeting here today. 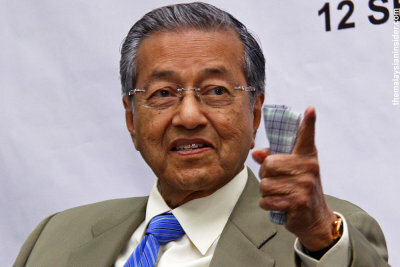 Mahathir said Malays only had themselves to blame for the predicament they are in now, pointing out that the community has not made efforts, even though many opportunities have been given to them. The Pakatan Harapan (PH) chairman said while the country was rich in resources, if no efforts were expended to extract those riches, “we will continue to be poor and left behind”. “Let us say we have gold and silver buried in the ground in our houses, but if we do not make efforts to dig and extract those metals, it will not make us rich. “On the contrary, we like to give opportunities to other people who are more hardworking to dig the ground and extract such metals. They become rich because they are willing to work hard. “This is our main weakness which has caused us to fail. We do not like to work hard. We want it easy. If we can, we would rather have riches come rolling in or flying at us. “When that happens, we will continue waiting for riches to come to our doorstep,” he said. Mahathir said this was a characteristic of past leaders, who were able to identify how Malays prefer the easy way out and take advantage of that. Mahathir further stated that Malays must come to terms with the fact that they had faults and flaws. “If we do not work hard to overcome this, we will remain weak and will forever be bogged down by these faults and flaws. “The government is working towards helping the Malays succeed. But that does not mean we do not take care of the other races. It is clear that without help and opportunities, they can build themselves up. “The ones who are weak, who will become weaker, is us. So long as we are stuck in our old ways, we will continue to be weak and left behind. “One day, we will become so poor to the point that we’ll have to depend on the goodwill of others in our own country,” he added. The root of poverty is come from the false Islamic teaching that make people does not want to harder because the Islamic scholars always say that if we die we do not take our money, wealth with us to the grave. Why we should work hard in this world. We live here only few years—do not worry about children Allah will take care our children. What we need to do in this world is to worship Allah as much as possible or pray to Allah many times as possible.—Allah will give you paradise. If you believe in the precent Imam you will go to paradise. If you have a lot of wealth it will be asked how did you get your wealth. You will get in trouble. So this kind of Islamic teaching is wrong absolutely, make Muslim become lazy people or unproductive hand. That is we do not see a product MADE IN SAUDI IN MALLS. Because they are lazy to work, they are diligent to pray many times a day and dzikir for hours in a room. This is life style of most Moslim in Islamic countries. I think Ahmadiyyah do the same they hate the world or “dunia” they focus on the next paradise. Whereas the true Islamic teaching is to make people’s life prosperous and happy. Or make Muslim becamo rich and wealthy. If Muslim still live in poverty they carry out the wrong Islamic teaching. We wish you all a prosperous new year filled with God’s blessings and good health. May we all be guided on our true paths to the Almighty.